Can't wait to spend the Holidays with my baby! What can I say? It has been a good month so far... American clients got drunk last weekend and gave us money bwahaha... then the 14th month pay that the company will be giving (aside from the performance bonuses, xmas ham, and the early 13th month pay). Another party this weekend and if the CEO and his associates get drunk, money will be given away again for no apparent reason. I got tired of reading Archies so last weekend I bought some Asterix and TinTin comics just to see if I will still like them. I used to read these comics way back in the grade school library. If I liked them still, I'll be collecting those titles. Right now, I need to buy New Avengers Civil War or Spiderman Civil War for my "monito" this Christmas. Just stopping by to wish you a Merry Christmas. about sa comment mo po - kahit kelan ndi pa po ako nakakapunta ng komiks convention =p hehe bkt po? merry christmas hazel! and to our baby! hi... are you a lasallian? 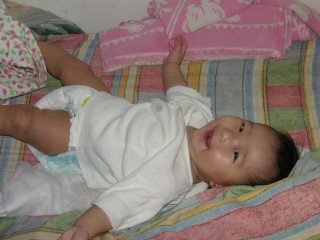 Ang cute ng baby mo! :D Happy New Year!